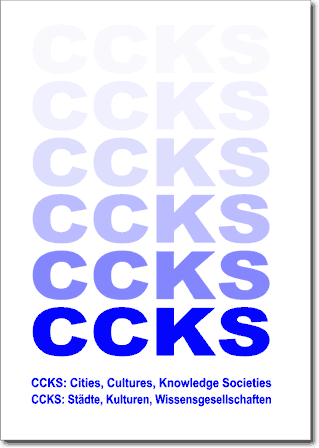 Based on the UN studies on urbanization in the world, the UNESCO-theses to knowledge societies INST brought his project "Cities, cultures, knowledge societies" the aspect of culture in the analysis of current developments one. Starting INST expeditions in Vienna and Linz, followed up by Longyearbyn, Berlin, Paris, Moscow, New York, Riverside, Buenos Aires, Cairo, Johannesburg, Yaounde, New Delhi, Seoul, Beijing, Baku, Almaty, Bishkek, Tbilisi, Jerewan, Dushanbe, Nalchik, Vladikavkas and many other cities a lot of experience was collected, how to develop knowledge societies today. The research is directly related to the current crisis that was triggered by an imbalance between money and real productions. The exclusion of about one third of the population is seen as a cause by INST that at least both about one-third of the population in "rich" countries, but many more in other countries live in poverty as well as the states struggle with budget deficits and monetary problems. As always, the book consists of a polylogue with politics, fundamental contributions to the subject, but also detailed and regional studies.